Given my short stay in Brussels I wanted to make sure I had one great food experience and I wanted it to be something that was traditionally Belgium, something more than really good beer. 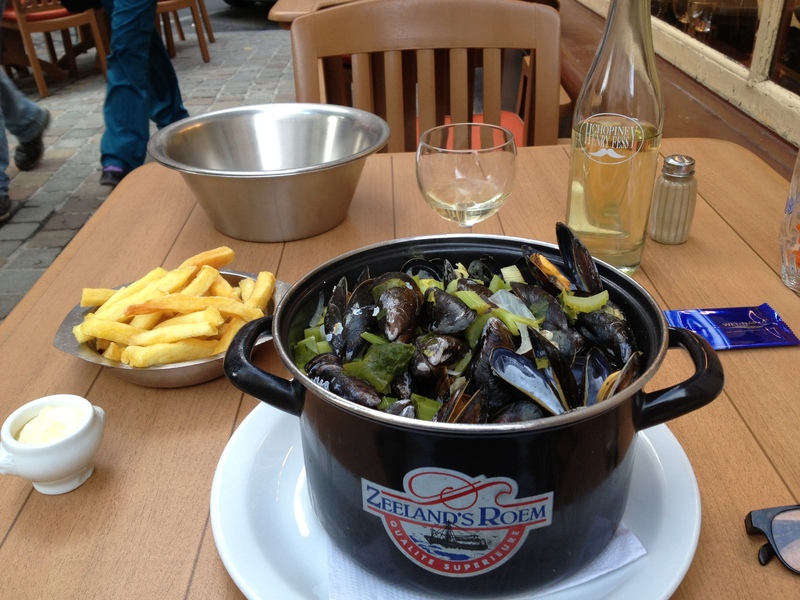 So I asked Mr. Google where I should go to get the best Moules Frites in town, this would allow me to taste both the world-famous fries of Belgium and the equally famous Mussels. 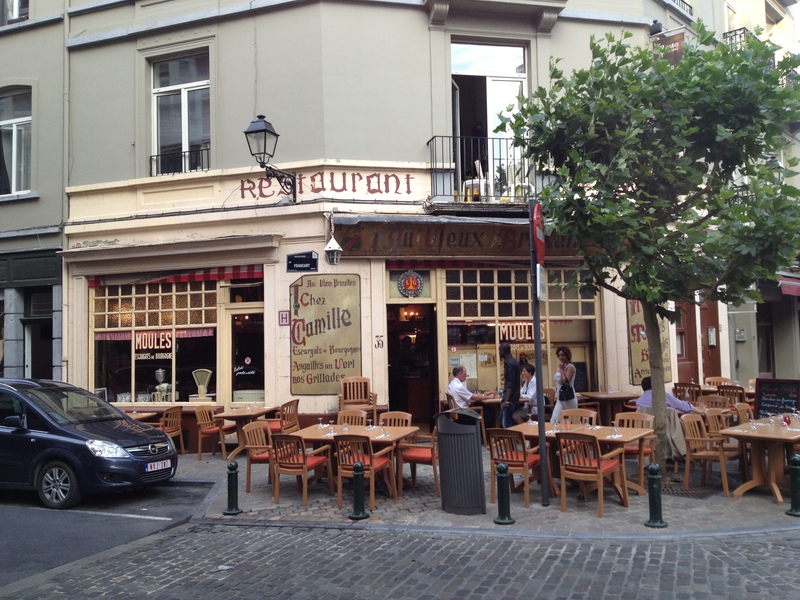 After reading many lists of possible places to go I decided on a little corner bistro called Au Vieux Bruxelles that was highly recommended on-line and has been in business since 1882. It is located outside the historic tourist area, which to my mind was a great thing. 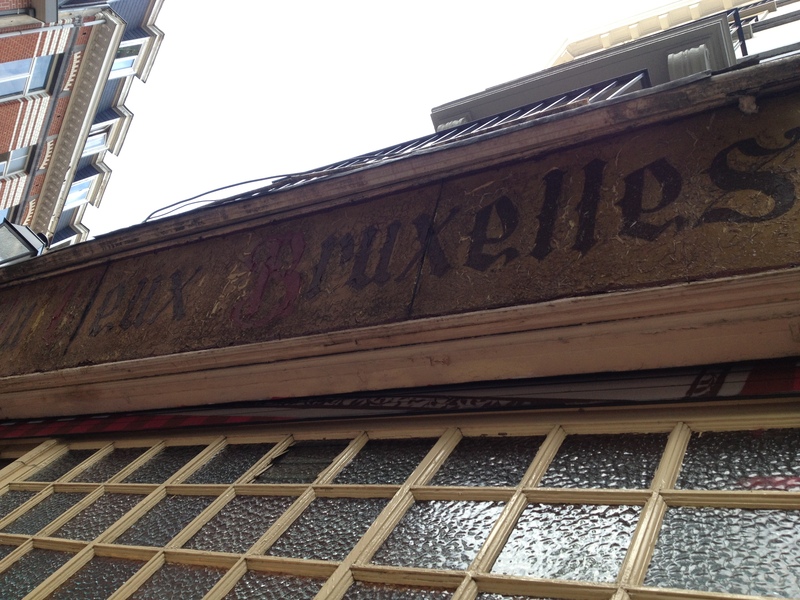 And although it was located in the posh shopping district of Ixelles it was on a rather diverse corner that intersected the largest African shopping and dining street in all of Brussels. This appealed to me as a New Yorker who really likes diversity and also as a tourist who wanted to go somewhere that wasn’t touristy or on a street crowded with Moules Frites joints with hawkers outside trying to lure you in (and there are a lot of those in the historic center). 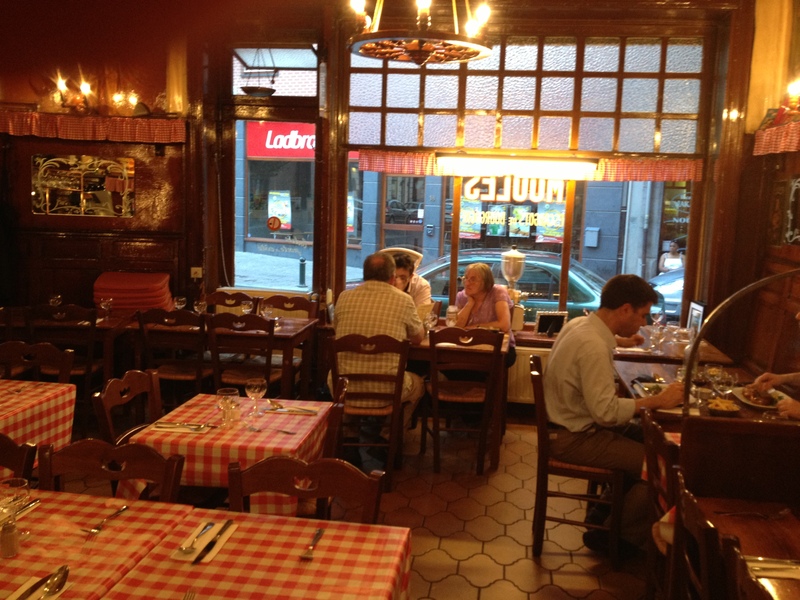 Au Vieux Bruxelles is tres charmant – and the waitress was lovely, when I went to the door should told me in French that I should sit outside because inside was very hot. A few people I met joked about what they called “Belgium air conditioning” meaning none or very poor. So I sat outside which was great as I got to watch the street life while I waited for my meal. 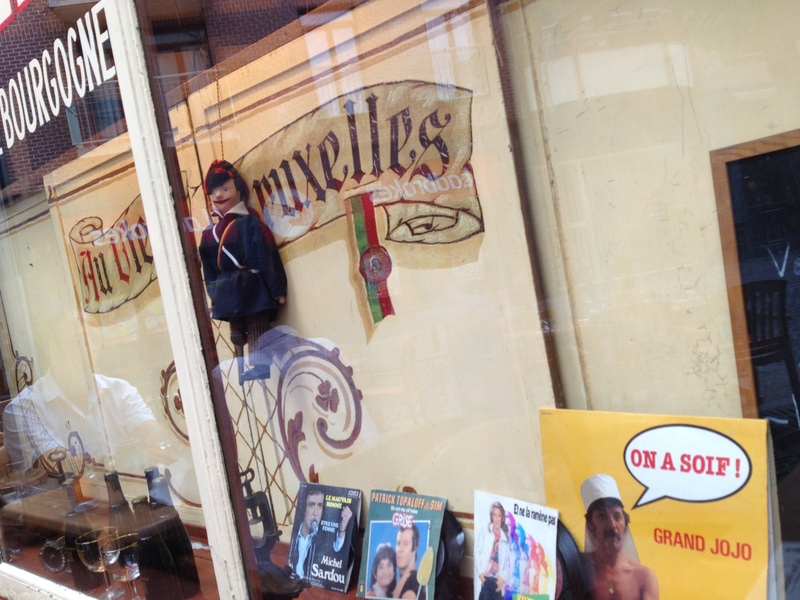 One of my favorite things about this place was the window which displayed a rather quirky collection of artifacts. 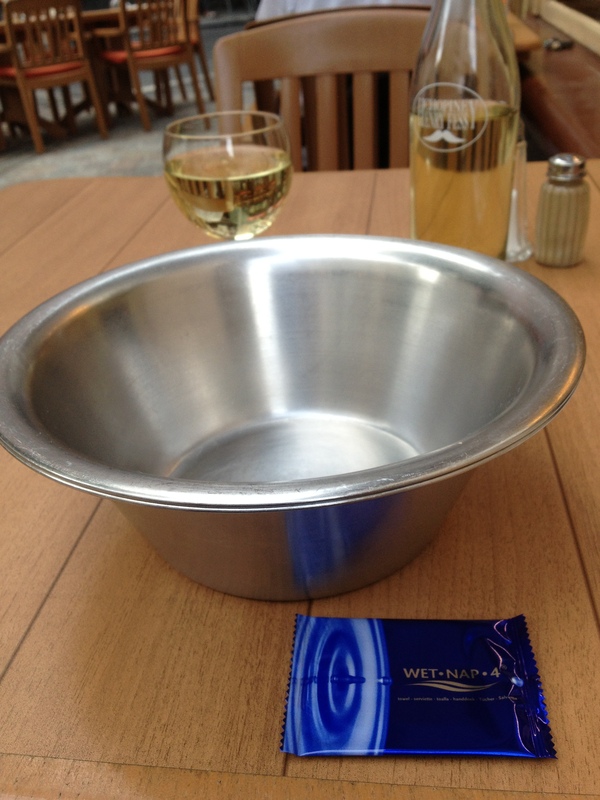 This is the preset before your meal comes – impressive that you can’t tell that there are actually 2 empty stainless steel bowls so when they remove the first full one viola! There is a fresh empty one waiting for you. The wet naps are a tad tacky, but indeed very helpful. 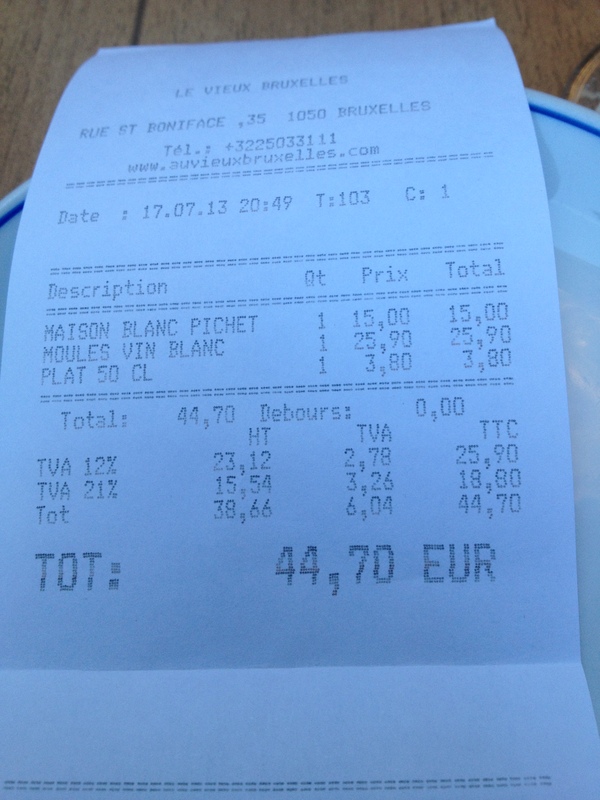 I ordered a pichet of the house white wine (15 Euro /$19.75) it was crisp, dry and cold and a fine foil for the Mussels. And speaking of Mussels they serve them in 11 different versions – I got the basic white wine version after some discussion with the waitress (22.50 Euro /$29.62) it was between the house special:Bacon Chicory and Cream or the Tarragon Cream. The idea of cream seemed a little heavy on this hot Summer’s eve so I defaulted to the basic wine version. for your nearly thirty bucks you get a small bowl of frites – I thought it should have included a small salad as well as from a New York point of view this was by far the most expensive bowl of mussels I have ever encountered. The price didn’t really bother me initially because the service was so good and the place so truly charming (I know I’ve already used that word to describe it but look at it – it’s just so old and quaint and charming! ), but the meal wasn’t very tasty. The frites were oddly chewy which made them great for dunking in the Mussels wine broth, nowhere near my favorite fries I’ve ever had – this being the only order of frites I ate I have nothing to judge it against and so who knows maybe this is what a Belgium frites is supposed to taste like? The Mussels were served in a large enamel pot – a generous portion to be sure, instead of wine and herbs and maybe a touch of cream (fat being such a good flavor enhancer) they were made with lots of wine and celery….celery? At first I enjoyed the fresh crunch of it but there was a lot of celery in these Mussels and after the first 6 or so I was wish for something more complex or interesting than expensive Mussels in cheap wine and celery. This did not stop me from eating the entire pot full or all my fries….it just wasn’t very exciting. I’m going to say something now that I hate it when other people do it but here goes: I make better Mussels at home. Of course I am not Belgium nor do I have a 150 some odd years of experience making them so for all I know these were reasonably priced precisely made traditional Moules Frites. To me they were just boring and overpriced. Love the idea of a “mini” dessert. 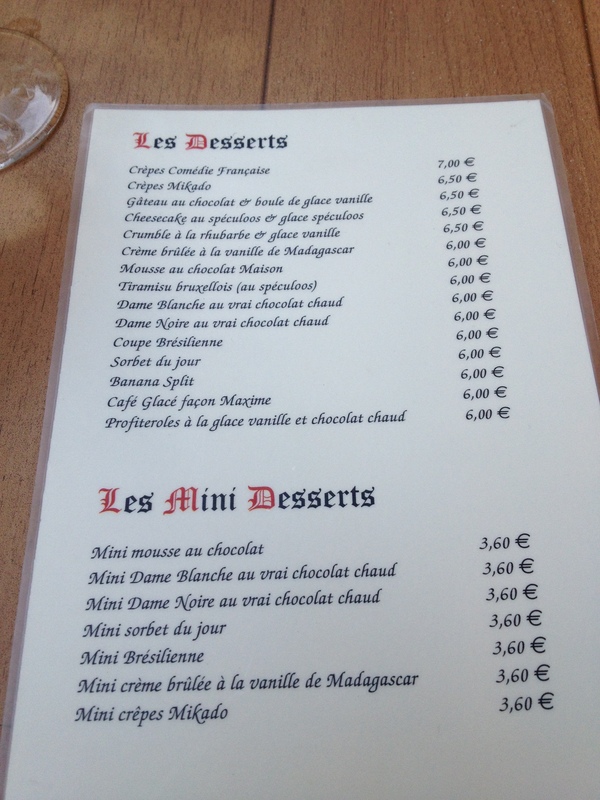 I choose either mini or maxi though was tempted to order the Crepes Comédie-Française as they are served flambe at the table. Instead opted to finish my wine and get the L’Addition. 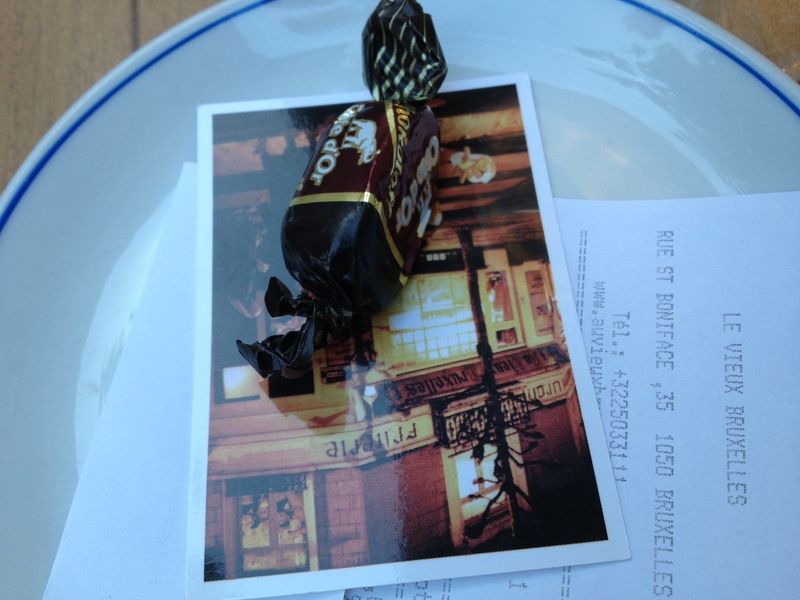 This entry was posted in Other Stuff, Travel and tagged au vieux brussels. Bookmark the permalink. 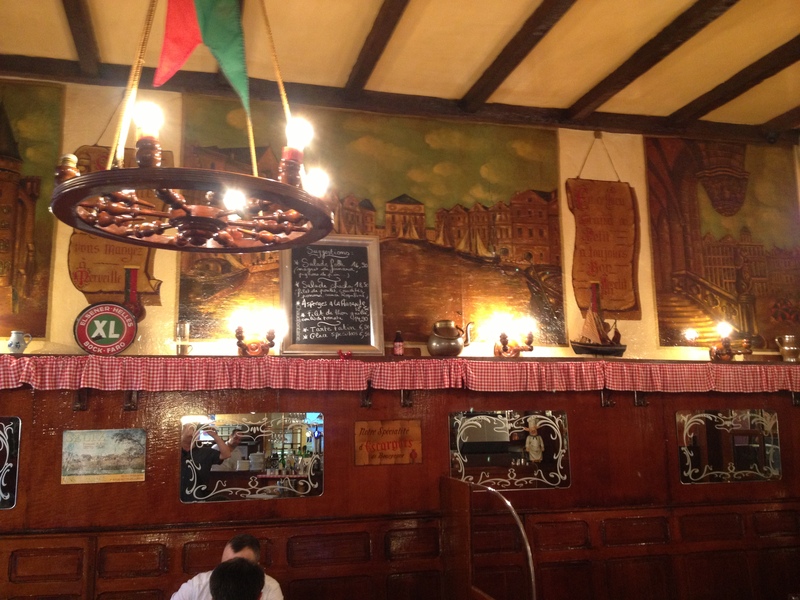 I am enjoying being an armchair traveler and seeing the sights of Europe. I love the names of the desserts.